Trust Media Viewer Ads is an application categorized by virtual security professionals as adware. Often these applications enter systems of unsuspecting users because most of them tend to skim through the installation process. Also, some users tend to install these applications believing that they will be provided with useful information regarding online shopping. In reality, no adware application will improve your online shopping or browsing. Applications like Trust Media Viewer Ads are only capable of disrupting the web browsing experience. If you do not wish to be disturbed by commercial ads, you should remove Trust Media Viewer Ads ASAP. As soon as Trust Media Viewer Ads infiltrates your operating system it will install extensions to all the major browsers like Mozilla Firefox, Google Chrome, Internet Explorer. These add-ons are used by the application in order to connect to the remote adware server. Adware servers provide various commercial adverts that will flood your browser. Furthermore, you will be presented with various pop-ups that could promote various fake updates. These allegedly legitimate updates could turn out to be the reason of further infections. Thus, it is undeniable that Trust Media Viewer Ads requires removal that should be executed right away. Like a lot of other adware applications, Trust Media Viewer Ads is free of charge, and the publishers are proud of that. It is important to know that this is possible because Trust Media Viewer Ads provides third-party applications. But what is worse is that the associated third-parties and their activities are not reviewed in any way meaning that malware distributors could buy a slot so their fake advert with a redirect link would be presented within your browser. It means that you could land on a website containing an arbitrary code execution exploit. The exploit can inject your PC with an infection just by entering the website. Avoiding any potential virtual threats should be at the top of your list. Thus, removal of Trust Media Viewer Ads is paramount. Furthermore, if you want to keep your system secure you ought to implement a licensed antimalware tool mainly because it has an up-to-date database, and any infection can be detected and removed in an instant. Detecting and removing infection manually is a skill that is acquired over years thus, unless you are a malware expert, your system should be running a powerful antimalware tool. Manual removal guide that is provided below is a good start. After you remove the infection manually you should use the lists of files and registry entries that we provide to remove Trust Media Viewer Ads completely. If you find this task too complicated or just time consuming we firmly advise you to use a professional antimalware tool instead. First tap the Windows key+Q on your keyboard. Then tap Enter on your keyboard. Locate Trust Media Viewer and uninstall it. Click the Windows button in the lower-left corner of the desktop. 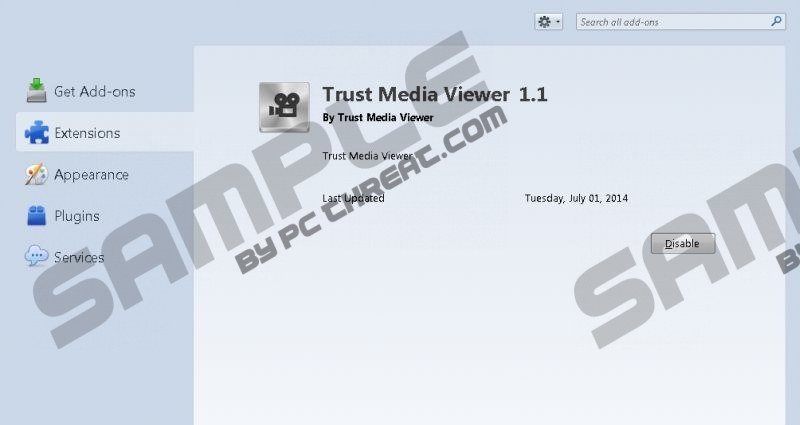 Select and remove Trust Media Viewer. Select and remove Trust Media Viewer from the program list. Quick & tested solution for Trust Media Viewer Ads removal.